A total of 8 matches were played today of the ongoing FIFA World Cup 2018 friendly matches. The Match wise highlights of all 8 matches are appended below. It was a match between two strong teams namely France and Italy. Both teams are the contenders of winning the upcoming FIFA World Cup 2018. And, each one hoped to win this friendly in order to step up their preparations for the mega event. The team who was going to score first would always have the upper hand in the match. And, that’s exactly what happened as Umtiti netted the ball at the 8th minute and the scores was now 1 – 0. Italy’s strikers now had to show their prowess by levelling the scoreboard. 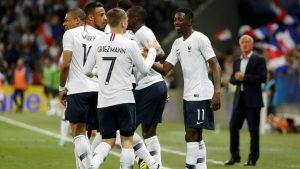 But, the opposite happened as France’s prized attacker Griezmann scored off a penalty at the 29th minute to make it 2 – 0. The score was now 2 – 1 and neither team scored any further goals as the 1st half came to an end. It was now time for the 2nd half and Italy needed to re-think their tactics and come back with a better game plan. But, Italy failed in this objective as the French defense was constantly blocking their shots and Italy were regularly being denied off levelling the scoreboard. On the other hand, France were attacking the goal post of their opponents on a regular basis. And, after a series of attacks it was Dembele who netted the ball at the 63rd minute to make it 3 – 1. This was the end of the game for Italy as no goals were scored by either side and the Italians lost to France by a margin of 2 goals. Egypt looked to win against Colombia without Mohammad Salah who had been injured in the Champion league final. On the other hand, this was Colombia’s last game before the FIFA World Cup 2018 in Russia and they aimed to win it. The 1st half went underway and unsurprisingly it was Colombia who looked to dominate in every department of this match. Egypt were far from impressive but they also didn’t allow Colombia to score as the 1st half came to end with the score being 0 – 0. On the other hand, Colombia were also hoping of ending their campaign on a high before the FIFA World Cup 2018. So, after the break the 2nd half went underway as both teams looked to score the opening goal of the match. But, even after substitutions and several free kicks from both sides not a single goal could be scored as the match came to an end. The final score was 0 – 0. Having lost their last 2 matches in a row, Thailand looked to win their match against China. Meanwhile, China had managed to win their last two matches as they are hoping to forget their failure of not qualifying for the FIFA World Cup 2018. Nevertheless, in this match China were the clear favorites and they won it easily by a margin of two goals. The Chinese took the lead in the 1st half when Wu Lei scored at the 34th minute and made the score 1 – 0. Thailand looked to score in the 1st half but couldn’t do so as it ended as China were comfortably in the lead. After the break, the second half went underway and all of a sudden Thailand’s defense was looking improved. But, this didn’t help them as it was Fan Xiaodong of China who netted the ball at the 74th minute and China were now leading by 2 – 0. 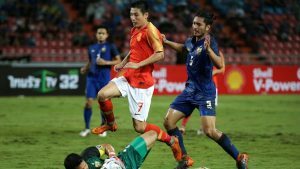 Thailand hoped for a consoling goal but they couldn’t score it as the match came to an end as China won it by 2 – 0. It was Gary Cahill’s return to the England and he had a point to prove. On the other hand, Henry Kane who was made England’s captain for the upcoming FIFA World Cup 2018 also had to show his worth. Also, Nigeria were also not going to be beaten easily as several World-class players were a part of this team. So, the match started as the 1st half went underway. Unsurprisingly, it was dominated by England as excellent show of passing was displayed. This lead was doubled by the English captain Harry Kane when he netted at the ball at the 39th minute to make it 2 – 0. This was the story of the 1st half as it came to end with England leading from the front by 2 goals. Nigerian fans needed hope and it was given to them by Iwobi who scored at the 47th minute to score the opening goal for his team. But, to the dismay of Nigeria this was the only goal that could be scored by them as the match ended with final score being 2 – 1. 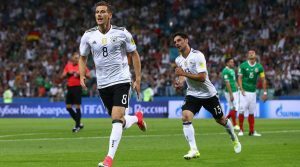 No one including Austria was expecting to beat Germany in this match as Austria had not won against Germany in 32 years. However, today a new Austrian team was seen in action as the Germans were beaten by a margin of one goal. The 1st half was dominated by Germany as Ozil had scored at the 11th minute to make it 1 – 0. Germany kept Austria at bay in the 1st half as their defensive maneuvers were more than enough for Austrian forwards. But, the 2nd half was a whole different story. As, it was the Hinteregger who managed to score at the 53rd minute and the scoreboards were now level. Germany now launched an attack on all fronts in hope of getting the lead by scoring a goal. Austria were now ahead in the score line and Germany despite being ahead in possession were lagging in scoring shots at Austria’s goal post. At this point, the Germans were clearly looking below-par and this led to their defeat against the Austrians as the 2nd half ended with the final score being 2 – 1. A tight match between Sweden and Denmark as both teams did not allow each other to score even a single goal. Comparatively, more shots were taken by Denmark but their strikers couldn’t get past Sweden’s defense. Same was the case for Denmark as they added a draw to their campaign towards the FIFA World Cup 2018. Overall, it was Sweden who looked to be on the defending side as not one of their 9 shots were on target. This stat could damage Sweden in the upcoming FIFA World Cup in Russia. Both Slovenia and Montenegro had failed to qualify for the upcoming FIFA World Cup 2018 in Russia. However, both started the match looking to win. And, it was Slovenia who managed to attain this objective as they won over Montenegro by 2 goals. The first goal was a gift to Slovenia as a foul allowed Slovenia to get a penalty. And, it was Roman Bezjak who scored it as Slovenia went 1 – 0 up in the table. On the other hand, Montenegro failed to score in the 1st half as it ended with the Slovenians firmly in the lead. Montenegro tried to level the score in the 2nd half but their attacks were excellently blocked by Slovenia’s defense. On the other hand, Slovenia increased their lead by one goal and this time it was Miha Zajc who netted the ball at the 79th minute to make it 2 – 0. This was also the final score of this match as it ended with a total score of 2 – 0. The last match of the day was a draw however, it was also the most thrilling one to watch. In the end it was the defenders who got the better of their opponents as many attacks were fended off by them. No team particularly dominated in the possession or in the total shots department. As, both Portugal and Belgium seemed pretty willing to win this match. The 1st half went without a goal as no team could breach each other’s defenses. The 2nd half although more interesting than the 1st one also had the same story to tell. Fouls were given and one yellow card came in the possession of Portugal. However, despite all this drama the match ended in a draw.